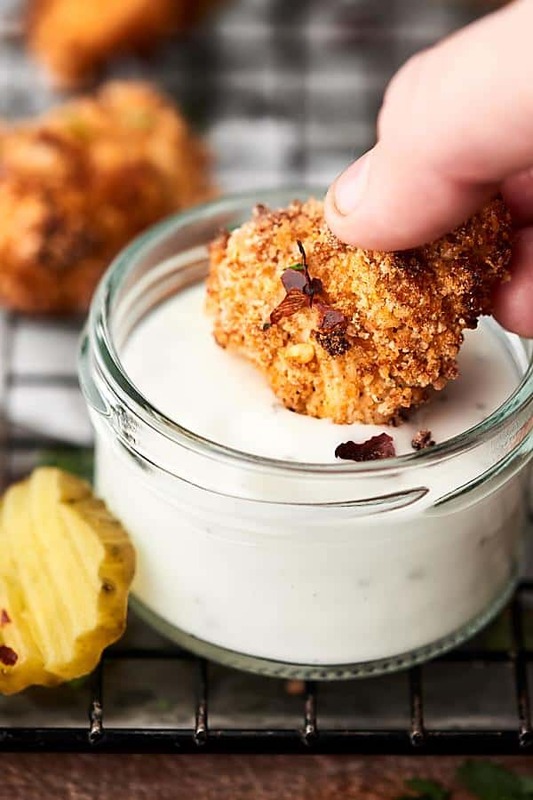 These Air Fryer Chicken Nuggets are a healthier, easier, and tastier homemade version of a drive through or frozen classic! Chicken breasts marinated in buttermilk, my secret ingredient and salt, then tossed in panko, whole wheat flour, and spices! 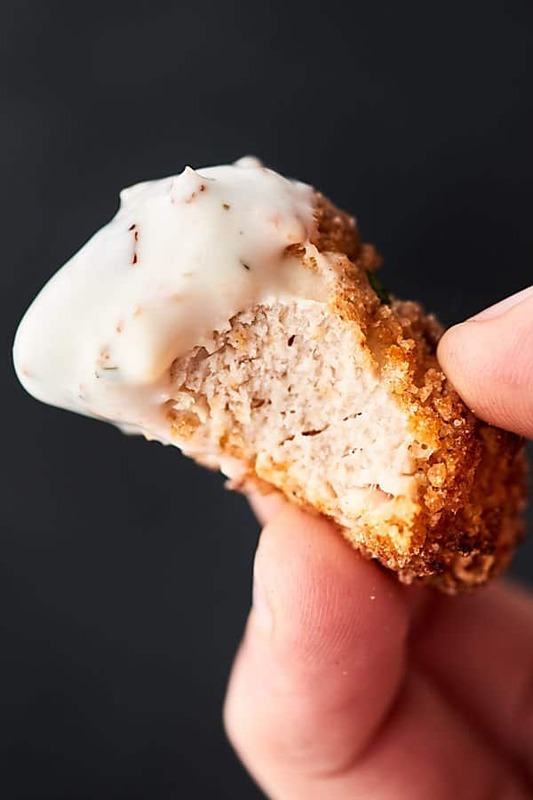 Easy chicken dinners like these air fryer chicken nuggets are the best! 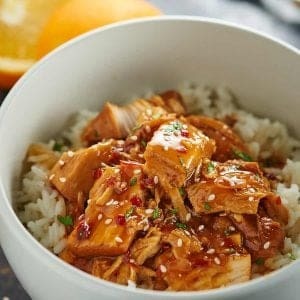 You might also love these other easy chicken dinners: slow cooker lo mein, bruschetta chicken, instant pot orange chicken, sheet pan greek chicken. I don’t know about you, but week after a three day weekend, I am fully on the struggle bus. I need just oooooonnnne more day. Ok. I really need like five more days . . .
To make the transition back to reality a little easier? You guys. Do you have an air fryer yet? Trust me. I went back to forth, because I wasn’t sure I really needed/wanted one. But I am LOVING it. Better than baking, healthier than frying. That’s a win win in my book. It’s very rare that once a recipe has been perfected, photographed, and filmed I have a chance to go back and make the recipe again. These chicken nuggets are definitely the exception to the rule. I have now officially made these FOUR times. And I know once you try these, you won’t be able to either. Nine ingredients and just a few minutes are required . . . skip the drive through tonight (trust me, I’ve been there after a three day weekend) and let’s make some homemade chicken nuggets instead! Is the air fryer really healthy? Depends on what you’re making, but overall, yes! Air frying is definitely a healthier option than deep fat frying. I know that was kind of a non answer, but here’s the thing . . . if you’re making cheese wontons in the air fryer . . . while it’s DEFINITELY healthier than deep frying, you’re still eating cubes of monterey jack cheese wrapped in wonton wrappers that are dipped into a mayo honey mustard sauce. 😉 So. In that case, the air fryer makes a super indulgent deep fat fried cheese recipe . . . health…ier, but I still wouldn’t categorize it as health food. Today’s recipe, however? Yes! 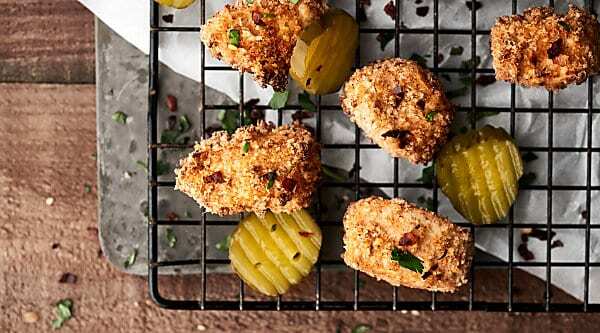 The air fryer definitely helps keep these chicken nuggets healthy. Air fryers use hot air instead of oil to cook food while still producing that crispiness we all adore about fried food. So, how do you make chicken nuggets at home? It’s SO easy. I promise. Making homemade chicken nuggets at home is practically as easy as waiting in the drive through line AND you probably have most of these ingredients at home already! You’ll start by cubing chicken breasts into 1/2 – 1 inch chunks. Throw those into a bowl and cover with buttermilk, pickle juice, and salt. Yes. 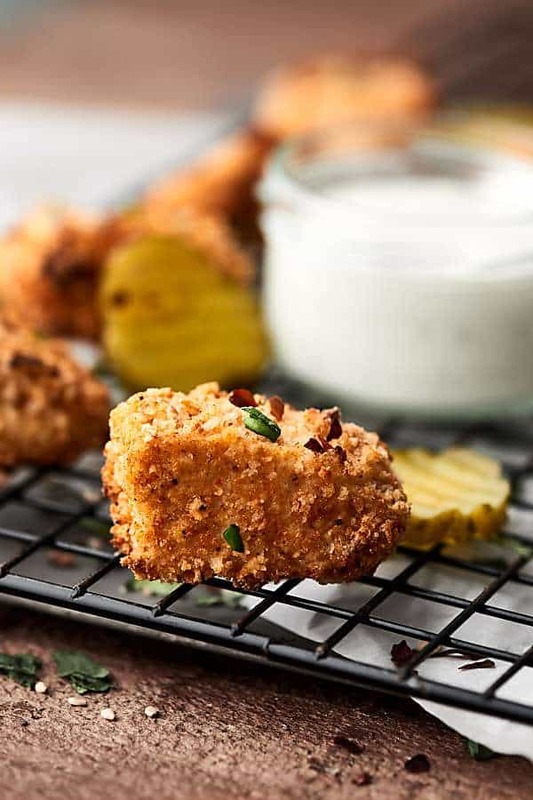 It makes these air fryer chicken nuggets SO tender and a little bit tangy and delicious. 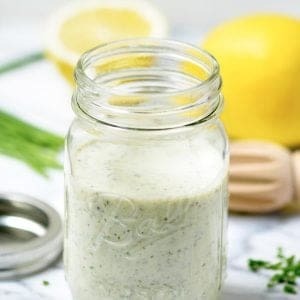 If you absolutely hate pickle juice, just replace with more buttermilk. The chicken marinates for 30 minutes, and then you’ll coat the pieces in panko, whole wheat flour, salt, pepper, paprika, and garlic powder. How do you make chicken nuggets in the oven? 400 degrees F for about 10-20 minutes (depends on how crowded your pan is). Make sure to spray the tops lightly with cooking spray to promote browning. Let me know in the comments below if you want more specific recipe! That’s it! 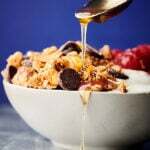 This recipe is SO quick, easy, and of course, tasty! The chicken is insanely tender and the outer coating gets amazingly crispy and is seriously packed with flavor! 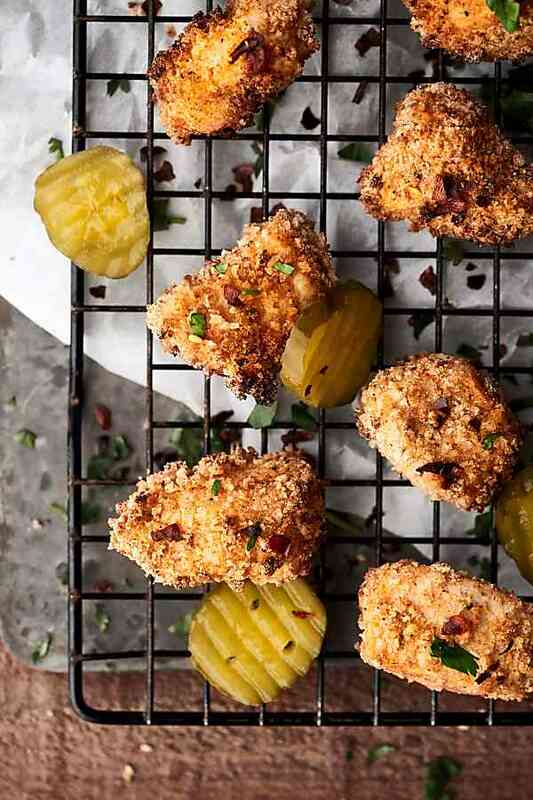 A drive through or frozen classic, these homemade air fryer chicken nuggets are quicker, easier, definitely healthier, and I promise you, even tastier! 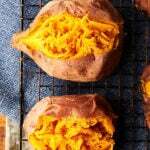 Do you want more air fryer recipes? Show Me the Yummy! In a large bowl, combine chicken with buttermilk, pickle juice, and salt. Marinate 30 mins at room temperature. You can also marinate, covered, in the fridge for a couple/few hours. Drain marinade and set chicken aside. Place drained chicken into baggie with panko mixture, seal, and gently shake until chicken pieces are fully coated. Then hit “PRE-HEAT”. Set the temperature to 400 degrees F and set the timer to 8 minutes. Open up the air fryer and spray the basket with cooking spray. Place in the chicken nuggets, work with about 12 at a time, so you don’t over crowd them. Repeat with remaining chicken nuggets. Taste and re-season, if necessary and serve with your favorite dipping sauce! *You could also do this is another bowl as shown in the video, if you like. ** See post above for baking instructions. They look amazing! What brand of air fryer do you use? Thanks Sue! This is the one I use: https://amzn.to/2L73gpr 🙂 Love it! Hey! I see the nutritional information but how many/much are you using to equal 200 calories? These nuggets are to die for! We also found a receipt for a copy cat Chick Fil A sauce – yummy combo!